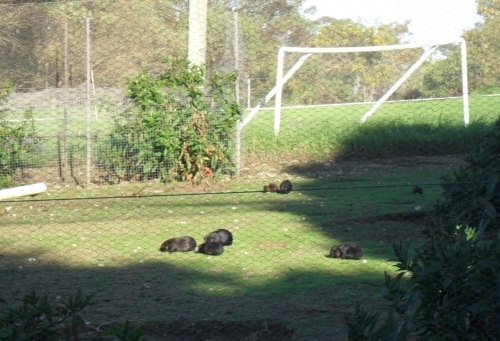 Grazing guinea pigs in the orchard/chook yard out of town. Last Friday afternoon we packed up our three remaining boar guinea pigs and took them for a drive in the countryside to a lovely property where the folks there keep guinea pigs and chickens in a netted orchard. I had read of keeping guinea pigs and chickens together before and in this example they really worked well together and did their own thing. With past problems of in-breeding our three lads were welcomed as they would introduce some ‘new blood’ into the population. It was great to see our males find a new home and it now means our own guinea pigs numbers are finally back to a manageable level again. After the losses of the last few months due to stray cats in the garden and the birth of six new babies we are starting again and I have some new ideas after making this visit out to the farm. At present our guinea pigs are housed in a large hutch to keep them safe from the cats. Although I have not seen a cat in the yard for some weeks now, our last two free-range guinea pigs suddenly vanished overnight. That was around last Wednesday. Seeing firsthand how the chickens and guinea pigs interacted with each other I am looking at housing our guinea pigs with the chooks. Already I can see the benefits. More space to roam again. I really dislike keeping them caged up. I much prefer having them roam on their own and keeping them in the chook yard will give them a bit more freedom once again. They will still be in a semi-secure area and have access to convenient shelters from curious chooks, stray cats and whatever else may come their way such as storms or hail. When they were free-range before they snuck into the chook yard to nibble on scraps and now they can share the feast freely. This means that we won’t have to discern between what we feed the chooks and the guinea pigs. All the kitchen scraps for them can go in the one spot and they can deal with them at their leisure. Being in the one spot – as with the chooks – means that their droppings will be concentrated in the one area and this will make it easier to clean. I actually don’t see it as cleaning anymore because now that I am using the woodchips in the yard I just need to keep it turned over until I use it on the garden – and then it will have chicken and guinea pig manures in it! The greatest advantage is that with the six remaining guinea pigs being in the chook yard I can remove the hutch and use the garden space to plant more vegetables. It also means that although they are not free-range in the garden, I can concentrate on planting vegetables wherever I wish and not having to protect certain plants from hungry guinea pigs. Given that I am really playing all out in the garden this year for a big harvest this is going to be very helpful. I will need to make some slight modifications to the chook yard perimeter to make sure the guinea pigs stay where they are required, but still give the chooks a bit of access to places. Oh, I must mention too that we have had Jennifer Aniston go clucky again and have been given some fertilised eggs from a friend so I also need to give her a bit of room to have her own space.